Today is my cousin's daughter 16th birthday and she held a BBQ celebration this evening. October also happens to be the month of the birthdays of my godbrothers, as well as my cousin's other daughter. I made them a handful of cupcakes and hope that they will like them. 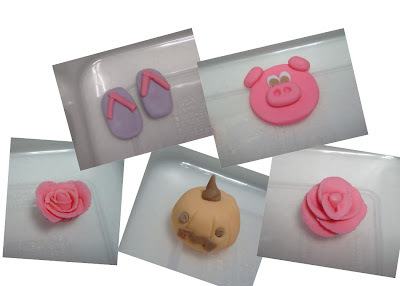 Using the fondant skills I have just acquired, I made some fondant stuff 2 days back (giving them time to dry). My godbrother is born in the year of the pig, so I made him a pig face. My niece Peiwen, gives me the ever-relaxed, happy-go-lucky feeling, so I made her a pair of flip flops. For my other godbrother Wilson and other cousin's daughter Michelle, I am not sure what they will like (on hindsight, the pair of flip-flops should be for Wilson instead..), so I put cheerful flowers next to their names. 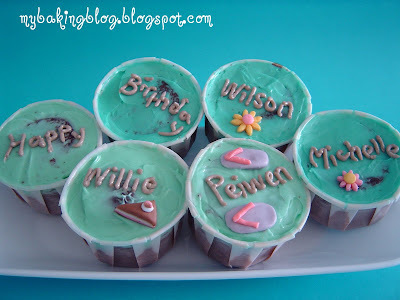 Last year, I gave Willie some cupcakes for his birthday too, I hope this year's cupcakes are an improvement. They are made with a different recipe, and I hope he finds them delicious. The chocolate cupcake is from Donna Hay's book named Chocolate. Willie will be back tonight from Hong Kong, so I guess they will be a surprise for him. I am not sure how they will like the cupcakes, because buttercream is not something everyone likes. I find that the locals do not favour buttercream because of the sweetness and high calorie count. That is why I tried to frost them as thinly as possible, instead of making nicer and higher swirls. I would have liked to keep them to a common theme, but the fondant figures that I made cannot belong to a common theme...so I guess..until I master more fondant figures, then I will try to make the colours and figurines to a common theme next time. 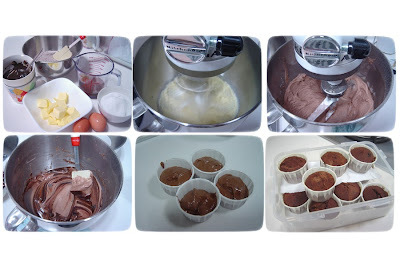 Recipe for the cupcakes has been added here! oohh what beautiful cupcakes! I recently moved to the netherlands from the U.S. and I too have to go easy on the buttercream because most Dutch people dont like this type of sweetness nor how fattening it can be. I say you only live once so eat the buttercream frosting! Im so in love with your critters,the bumble bee makes me smile! 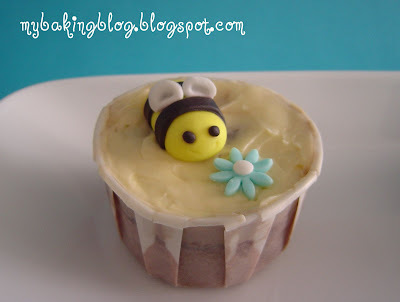 I love the bumble bee too, I learnt that from Youtube! 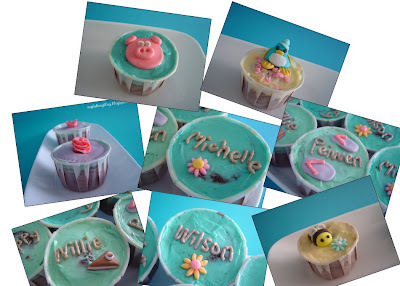 What beautiful cupcakes and you can't beat buttercream frosting, it's definitely my favourite! WOW what beautiful cupcakes Bimmer! i very sua ban de. i just eat lor. hahas. 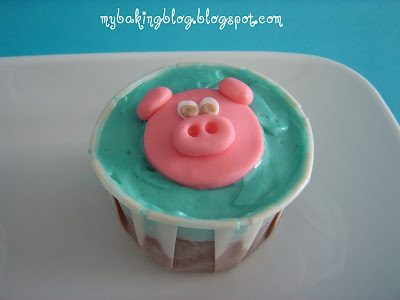 i love your little fondant pig!! how cute. 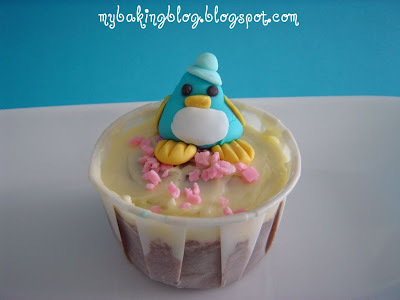 i haven't tried working with fondant before. i think you've inspired me! thank you! 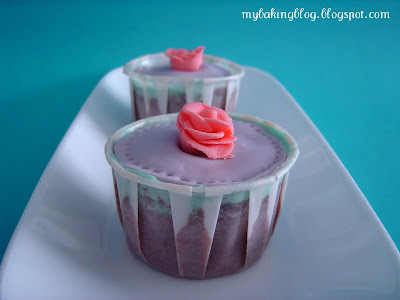 Do give them a try, they are delicious and fun to make! good that you are embarking on a journey of limitless fun! Baking soda is a kind of chemical leavener and you are right that it is usually used in conjunction with something acidic e.g buttermilk, sourcream, citrus juice etc. Based on my understanding, when mixed with an acid, they will react to form carbon dioxide and will cause a leavening effect. Most banana muffin recipes will usually call for only baking powder (since baking powder already contains baking soda in it) and there are no acidic liquids in the recipe. But there may be some recipes which call for both baking powder and soda. In such cases when both are used, the leavening is done mostly by the baking powder; the baking soda in this case is more for neutralizing the acids in the recipe plus to add tenderness to the recipe.